FALL BACK IN LOVE WITH THE GRIND | how to get paid a lot of money on each solution sale with tamconnect plus profit sharing partner program. Technology solution sales are a grind. If you have spent any time selling telecommunications, unified communications, and other related technology equipment in your life, it goes without saying that it’s a competitive industry. Hearing no and losing more sales than you are winning takes a toll on your profit margin, income, and emotional well-being. Therefore, TAMCO decided to launch TAMCOnnect Plus for the technology solution sales warriors. If you want to make more profits from each sale, TAMCOnnect Plus wants to give it to you. 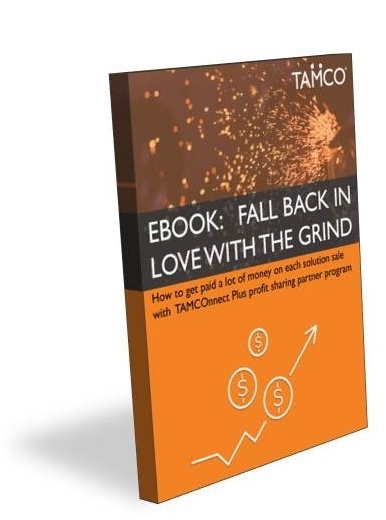 Learn how, download our free ebook: Fall Back in Love With the Grind | How to get paid a lot of money on each solution sale with TAMCOnnect Plus profit sharing partner program.